Strong winds have been observed around low mass and high mass stars, but stars like the sun present less evidence of high wind conditions. Standard models predict that our sun was much dimmer in its youth, but devising a way to keep the early Earth from freezing over has not been easy for climate modelers. An alternative solution — currently being reexamined by a group of researchers — is to assume our sun started out a bit heftier (and therefore brighter) than expected. 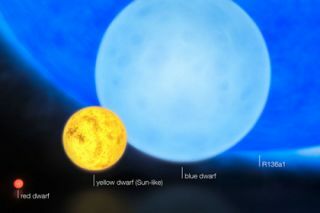 Most stars tend to increase in luminosity as they get older. This is due to their cores becoming denser and thus hotter over time. Assuming our sun has followed this same trend, one can estimate that it was 30 percent fainter 4.5 billion years ago. "The faint young sun presents us with a paradox, because the predicted temperatures on Earth and Mars would have been too cold for liquid water," said Steinn Sigurdsson of Penn State University. To avoid the so-called "faint young Sun paradox," scientists over the past 25 years have explored taking the sun off the "standard" evolution curve. By starting off with a smidgen more mass, the early sun would be bright enough to maintain liquid water temperatures on Earth and Mars. The catch is that the sun would need to have had an extremely powerful solar wind to blow off the excess mass and return it to its "normal weight." Sigurdsson and his colleagues are tackling this problem anew. With funding from the NASA Astrobiology Institute, they will use improved computer models along with the most recent solar data to compare various scenarios, as well as look for possible signatures in the sun that might reveal a "crash diet" in its past. The young massive sun hypothesis doesn't get a lot of attention these days. "I think it is a plausible hypothesis, which has not found great favor with the traditional climate science community," said Renu Malhotra of the Lunar Planetary Lab at Arizona State University, who is not involved with the current project. She wonders if others see it as a bit too easy, like cutting the Gordian knot. When Carl Sagan and George Mullen first identified the faint young sun paradox in 1972, they proposed to solve it by having ammonia, a powerful greenhouse gas, trap heat in the Earth's early atmosphere. But it was later shown that ultraviolet light from the sun would quickly destroy this ammonia. Most of the current attention is on models that assume the early Earth was blanketed by large quantities of carbon dioxide (as much as 100 times the current levels). However, this doesn't jibe with the geologic record, in which siderite (FeCO3) — a mineral that forms readily in high CO2 conditions — is largely absent in the oldest rock samples. Even if one could find enough greenhouse gases to keep Earth warm, this route doesn't seem plausible for Mars. Being farther from the sun, the Red Planet would need an unfeasibly large greenhouse effect. The amount of carbon dioxide needed, for example, is so high that clouds of CO2 begin to form, reflecting heat away rather than trapping it. "There's no greenhouse solution for Mars," Sigurdsson said. "But geochemists may not be ready to give it up." The lack of a clear climate resolution to the paradox leaves the door open for tweaking the initial mass of the sun. Previous work has found that this "open door" is really just a small window; the increase in solar mass has to be somewhere between 2 and 5 percent. Any less and the Earth won't warm up enough. Any more and the sun evolves into a different star than we know it to be. Sigurdsson's team is exploring this mass range using a new stellar evolution computer model, called MESA, that is more sophisticated than previous ones. The open source code was developed at the Kavli Institute for Physics by Bill Paxton and collaborators. Besides the mass, the researchers can adjust other relevant parameters, like the relative concentration of elements that the sun starts off with, as well as the degree of turbulence inside the sun's churning plasma. "We have a lot more data on the sun now to tighten the constraints on our models," Sigurdsson says. The tricky part is to have the solar wind slough off the extra mass in just the right amount of time. If the current solar wind had been constant over the lifetime of the sun, then our star would have lost only about 0.05 percent of its mass. Most scientists believe the solar wind was stronger in the past, but how much stronger is debatable. To provide enough planet warming without overstepping any solar constraints, the sun had to lose the extra mass in roughly the first few hundred million years, Sigurdsson said. That implies a solar wind that is about 1,000 times faster than what we currently observe. "You can likely find people that will say it is not feasible, but we need better observations to constrain the models," said Søren Meibom of Harvard University, who is also not involved with the project. Strong winds are known to exist around high mass and low mass stars, but medium-sized stars like our sun don't appear to be as windy. "It is quite challenging to find strong support for [a massive young sun] in astronomical observations of young sun-like stars," Malhotra says. "Young sun-like stars appear to lose mass initially very quickly." If the sun did lose a significant amount of mass in its youth, we might expect some telltale sign in solar system data. Some meteorites, for example, show crystal damage that appears to come from a stronger solar wind, but just how much stronger is not yet known. According to Malhotra and Minton, the most promising place to look for an orbit-related signature would be in the distribution of irregular satellites, which are moons like Saturn's Phoebe and Jupiter's Himalia that are in distant, inclined orbits. As the sun loses mass, it could increase the efficiency at which planets can capture irregular moons. Malhotra says she plans to study this effect more closely in the future. The goal of Sigurdsson's project is to look in the sun itself for some leftover changes, or "stretch marks," from an earlier, more massive period. They hope to find something that would be detectable with future helioseismology efforts, which study vibrations generated in the solar interior. "The core of the sun will hopefully provide us with some sort of sign," Sigurdsson said.